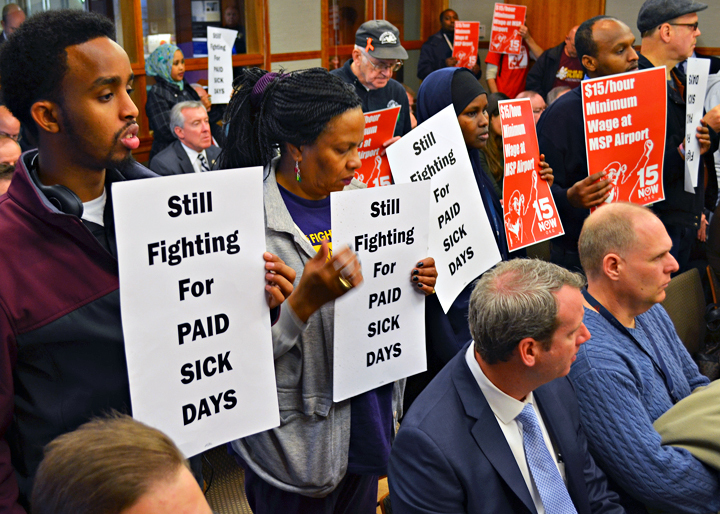 Airport workers’ campaign for better wages and conditions took a step forward today, as the Metropolitan Airports Commission unanimously approved a measure requiring employers to provide paid sick leave to all workers at Minneapolis-St. Paul International Airport. Supporters of 15 Now, a worker-led coalition seeking to raise the minimum wage at MSP to $15 per hour, cheered the MAC’s vote as a victory, but one that came at a steep cost for one of the campaign’s most vocal supporters. Kip Hedges, a baggage handler and 26-year airline employee, was fired by Delta Air Lines recently for comments he made in support of the 15 Now campaign in an interview with the labor-news website Workday Minnesota. During the open forum portion of today’s meeting, Hedges and other airport workers urged MAC members to publicly denounce the firing. If the MAC fails to send a message, Delta and other employers will be emboldened to retaliate against other workers who, like Hedges, take a stand against low wages – or for collective bargaining. Before being fired, Hedges was active in efforts to organize baggage handlers at Delta, a campaign supported by the Machinists union. He said a former co-worker reported being questioned last week by Delta management about his role in collecting signed cards in support of an organizing election. MAC members appeared receptive to workers’ concerns. 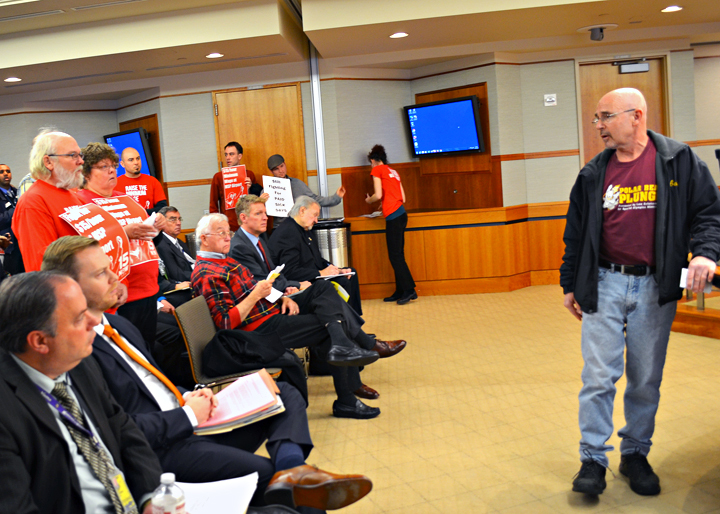 Carl Crimmins, a past president of the Minnesota Pipe Trades Association who serves on the MAC, said attempts by any employer to intimidate pro-union workers were unacceptable. He called for an ordinance to establish standards for labor relations at the airport. “I think a good, healthy discussion on a labor peace ordinance is something this commission should take up,” Crimmins said. “We wouldn’t, as a commission, have to deal with these issues ourselves,” Prosser said.